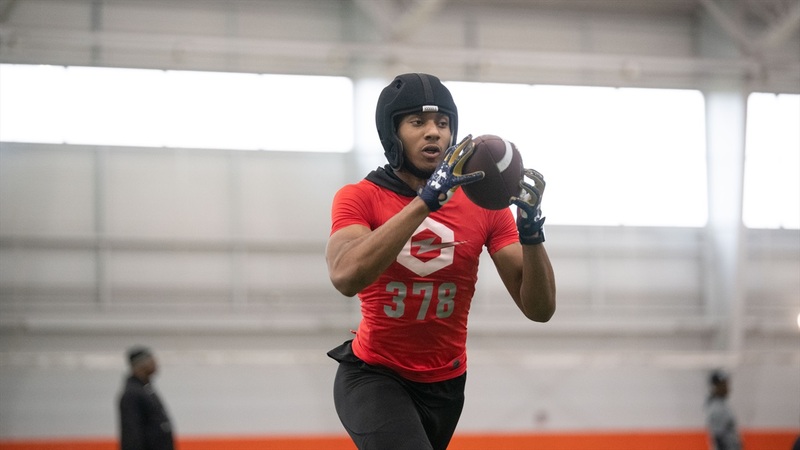 2020 CB Enzo Jennings | "Coach Lyght, that's my guy"
2020 4-star cornerback Enzo Jennings‍ impressed at The Opening regional in Canton this past weekend. He looked the part at a prototypical big corner measuring in at 6’0.5” and weighing 188 pounds. Even better was that he showed the quick feet and loose hips of a much smaller player. He was explosive out of his transitions and it helped him shine in drill work and one on ones where he was one of the top defensive backs at the camp. Jennings caught that interception while wearing Notre Dame gloves, which he flashed with a smile at the conclusion of the camp. He couldn’t stop smiling when the top of Notre Dame was brought up with the Irish recently cracking his top-11 schools. Lyght seems to be building a real connection with the Oak Park, Michigan native. It’s not all about talking ball and Jennings appreciates that. Jennings visited back in the fall with his teammate and, fellow Notre Dame target, wide receiver Maliq Carr‍. It was a memorable trip for Jennings and left a lasting impression for him. He definitely wants to make a return trip, but isn’t sure when. He’s hoping for sometime this spring to watch a practice. Carr recently put out his top-five schools and the Irish made the cut. Right now Jennings isn’t exactly sure when he’d like to narrow down his schools to five, but he wants to before his senior season. One thing Jennings does know? When he puts out his top group, Notre Dame will make the cut. “Notre Dame is definitely going to be in there,” Jenning said with a smile.